With the retirement of the baby boomers and lengthening life expectancies, programs critical to older Americans will come under significant strain in coming decades. 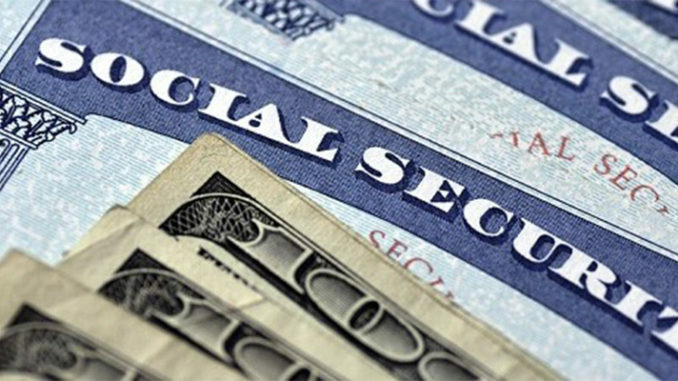 While the federal government provides major tax advantages to encourage employment-based retirement benefits programs and individual retirement savings, Social Security is the primary source of retirement support provided by the federal government. It is the largest single program in the budget. 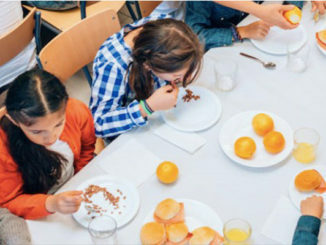 It is a vital lifeline to millions of Americans, but without action, it will lack sufficient resources to pay for all of its current benefits promises. Almost every American worker pays a dedicated payroll tax, which entitles them to benefits when they retire or become disabled. 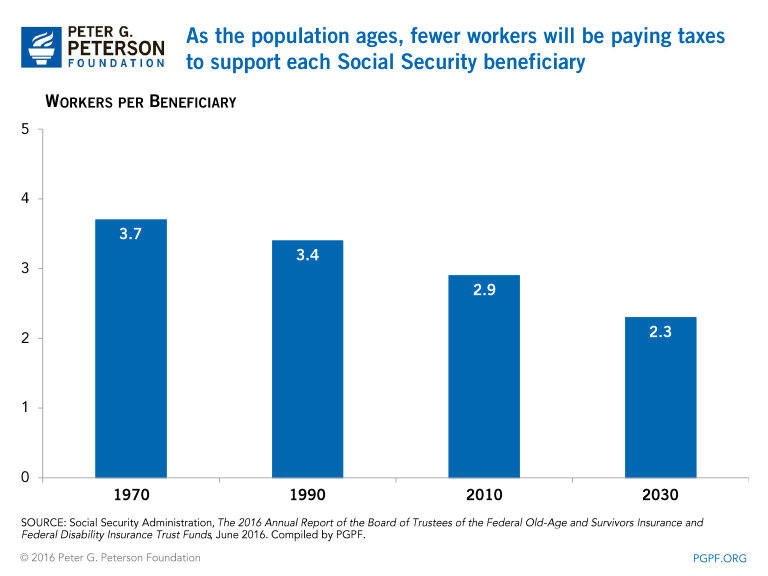 But as the population ages, fewer workers will be paying taxes to support each Social Security beneficiary, endangering the program’s finances. 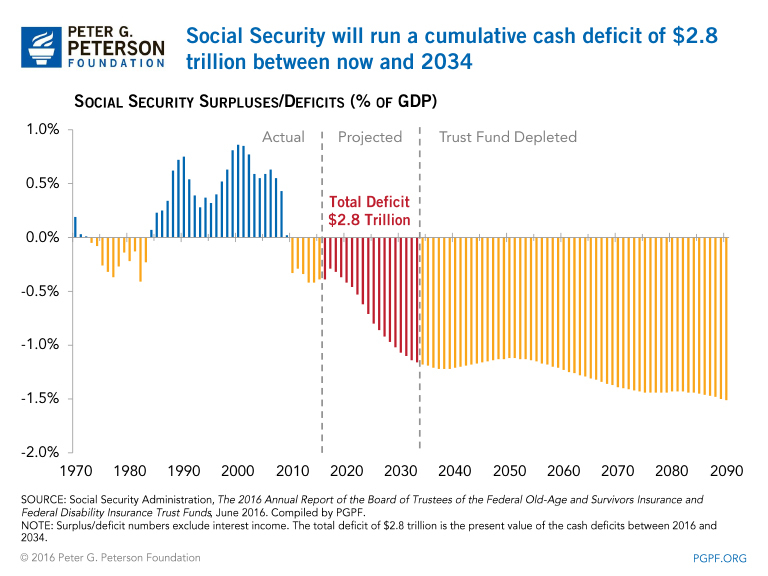 Social Security’s trustees project that the program’s trust fund will be depleted in 2034. At that point, 88 million Social Security beneficiaries could face across-the-board benefit cuts of 21 percent if policymakers fail to act. Raise the payroll tax rate from its current level of 12.4 percent on wage earnings subject to the tax. In 2016, earnings up to $118,500 are taxed. Lift the cap on earnings subject to tax. Today’s normal retirement age is 66 and it will be increasing gradually to 67 for those born in 1960 or later. Some propose increasing the retirement age to above age 67 for younger cohorts and increase the retirement age for future gains in average longevity. “Bump-up” benefits at age 85 to increase income for the oldest retirees, who are most likely to have outlived other sources of income. Policymakers face the challenge of preserving the adequacy of the retirement system in a fiscally sustainable way that would strengthen support for those who need it the most while recognizing the limited ability of retirees and near retirees to adjust to major disruptions in their financial situations. For that reason, proposals often exempt workers ages 55 and above from any reduction in benefits and gradually phase in benefit reductions for younger people in order to give them time to accumulate more resources for retirement through pension plans or other savings. Importantly, if policymakers act sooner rather than later, they will have more reasonable options, which can be gradually implemented to reduce their impact on individuals. Conversely, every year of delay and inaction limits options and makes reform more difficult. Knowing how policymakers will resolve the fiscal imbalances in the Social Security program is especially important for low-income people who rely so heavily on the program. 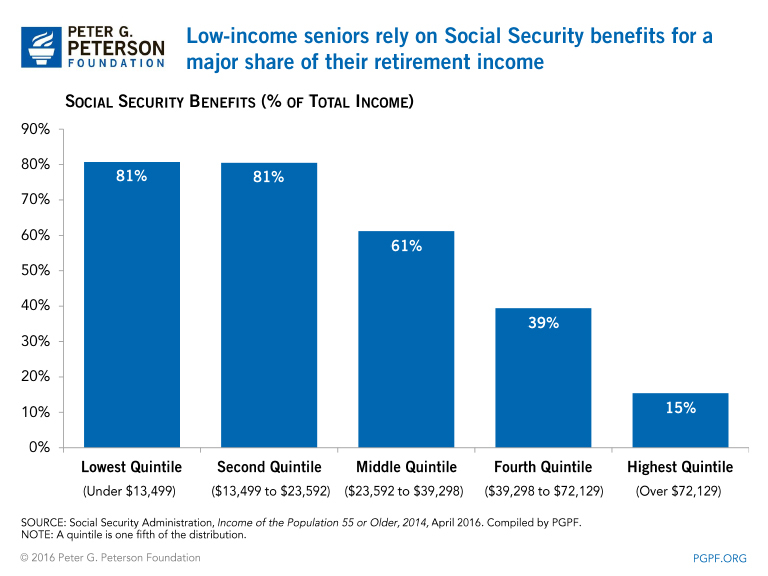 In 2014, Social Security provided more than 80 percent of the retirement income to those in the bottom two quintiles of retirement beneficiaries (seniors with $23,592 or less of total income). Additional Social Security reform options can be found on the Social Security or CBO websites.